526 Beacon is located on the north side of Beacon, between Massachusetts Avenue and Charlesgate East, with 520 Beacon to the east and 528 Beacon to the west. 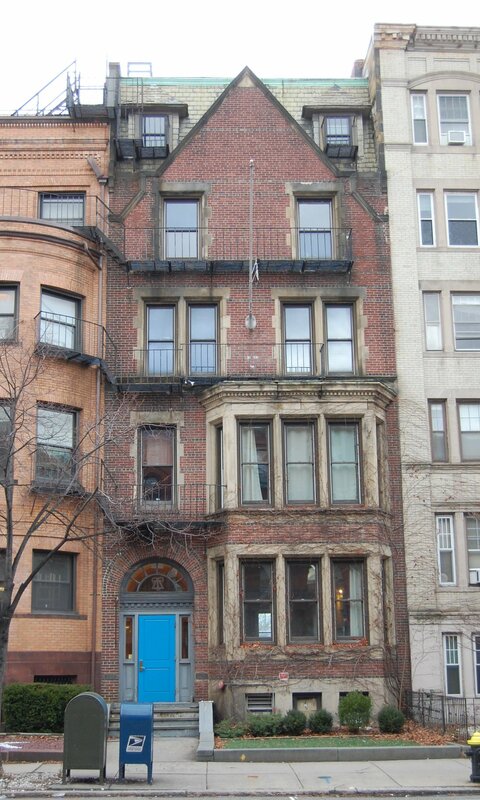 526 Beacon Street was designed by Walker and Kimball, architects, and built in 1895-1896 by Connery & Wentworth, masons and builders, for Dr. Oliver Fairfield Wadsworth and his wife, Mary Chapman (Goodwin) Wadsworth. He is shown as the owner on the final building inspection report, dated July 9, 1896. Blueprints for 526 Beacon — including floor plans and front and rear elevations — are bound with the final building inspection report in the collection of the Boston Public Library’s Arts Department (volume 77, page 61). A comparison of the front elevation filed with the final building inspection report and photographs from later dates indicates that the upper stories either were not built as originally designed or were significantly remodeled sometime prior to 1942. The Building Department’s records do not include an application for any such remodeling. Oliver Wadsworth purchased the land for 526 Beacon on April 28, 1893, from Dr. James Read Chadwick, a physician who lived at 270 Clarendon. James Chadwick had purchased the land on June 2, 1887, from the Boston and Roxbury Mill Corporation. Click here for an index to the deeds for 526 Beacon. 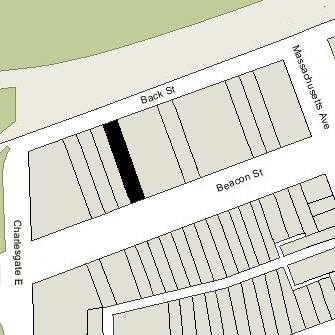 On February 24, 1890, James Chadwick had entered into an agreement with the other owners of land on the block limiting (until January 1, 1905) the depth of any new buildings to 90 feet from the north line of Beacon (with bays and other projections limited to extending another 5 feet), and limiting the height of stables and other ancillary buildings further north to no more than 12 feet in height. The agreement probably was prompted by construction of The Austerfield at 7-9 Massachusetts Avenue (502 Beacon). It was the only building on the block and its north façade extended to Back Street. By the 1895-1896 winter season, the Wadsworths had made 526 Beacon their home. They previously had lived at 393 Boylston. Oliver Wadsworth was an ophthalmologist and also maintained his medical office at 526 Beacon. He was one of the founders of the Boston Medical Library Association in 1875, and in 1884, he joined with Hasket Derby and Benjamin Joy Jeffries, also ophthalmologists, in forming the New England Ophthalmological Society. On January 14, 1908, Oliver Wadsworth entered into an agreement with the owners of 528-532 Beacon restating the restrictions on the depth of buildings and on the height of structures in the rear of the properties contained in the 1890 agreement (which had expired in 1905), extending the restrictions until January 8, 1918, for 526 Beacon and until January 8, 1923, for 528-532 Beacon. 530 Beacon remained a vacant lot and the agreement probably was prompted by plans to develop it. The restrictions were further extended to May 1, 1932, by a March 29, 1912, agreement among all of the owners of the property at 506-532 Beacon. The Wadsworths continued to live at 526 Beacon until their deaths, hers in May of 1910 and his in November of 1911. On July 15, 1912, 526 Beacon was purchased from Oliver Wadsworth’s heirs by John William Flavin. He was a clerk with the New England Life Insurance Company and lived in Roslindale with his mother, Jean B. (Sutcliffe) Flavin, the widow of John W. Flavin. 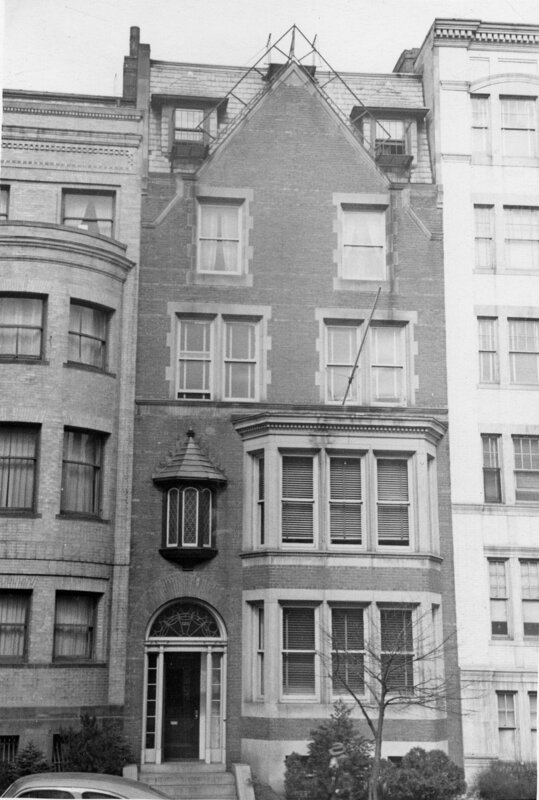 His sister, Josephine, was the wife of real estate dealer and conveyancer William J. Stober, and it appears likely that John Flavin owned 526 Beacon on William Stober’s behalf. 526 Beacon was not listed in the 1913-1916 Blue Books. On June 30, 1915, 526 Beacon was purchased from John Flavin by attorney Henry Horton Kimball. He and his wife, Edith M. (Hancock) Kimball, lived in Melrose. On April 11, 1916, 526 Beacon was acquired from Henry Kimball by the Technology Delta Upsilon Association to be the chapter house of the Delta Upsilon fraternity at MIT. It previously had been located at 1069 Beacon. In 1960, Delta Upsilon remodeled the interior of 526 Beacon. As part of the remodeling, the oriel window on the second floor, over the entrance, was removed. 526 Beacon remained the MIT chapter house of Delta Upsilon until April of 2014, when the chapter was suspended by Delta Upsilon International. For the next two years, 526 Beacon was a lodging house for MIT graduate students. In October of 2015, the Technology Delta Upsilon Association changed its name to the Technology Chapter Alumni Association. In the fall of 2016, 526 Beacon became the chapter house for the Technology Colony of the Theta Tau Professional Engineering Fraternity. The Technology Chapter Alumni Association continued to be the owner of the house.